The overriding majority of valve actuation applications in today’s industries are fulfilled with standard products. In some cases an actuator may need to be modified to suit specific operating requirements, but here again a solution based on a standard product can usually be found. There are occasions, however, when the physical and operational demands of an application rule out anything other than an entirely customised approach to the problem. 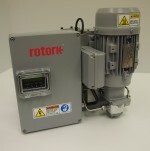 ROTORK-HILLER says its long-standing experience in the fluid power and motion control industries has been mostly built on the provision of actuators for critical and vital applications calling for the design and manufacture of solutions to suit customers’ individual requirements. Unlike other manufacturers therefore, customised valve actuation is the cornerstone of the company’s activity.